As part of WPCentral’s ongoing Xbox 360 coverage, we’ll sometimes discuss console titles of interest to our readers. Last week’s Arcade Next XBLA release was Bloodforge, a dark and gory action game from Climax Studios. This week’s release, Fable Heroes cleanses the pallet with a much lighter tone and cooperative play. Remember Fable Coin Golf, the Fable-themed Windows Phone exclusive that shared a connectivity feature with Fable 3 on 360? Fable Heroes is another spin-off, this time of the beat-em-up genre. 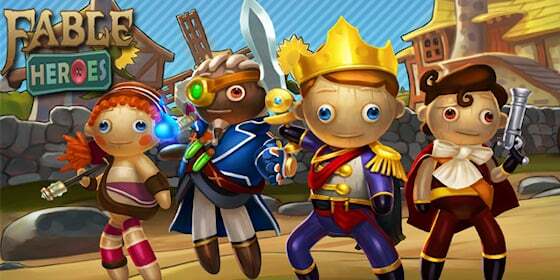 It also skews younger than the mainline Fable series, putting players in control of wooden puppet heroes as they romp through stages based on the console games. You won't find a story of any sort here (unlike past Fable games), as it centers squarely on the multiplayer experience instead. Head past the break for our full impressions. Yes, Fable Heroes was built from the ground up as a multiplayer game. If you choose to play solo, you’ll still be accompanied by three slightly-dimwitted AI companions. That isn’t so bad as the gold and abilities they collect remain unlocked when you switch to those characters for subsequent playthroughs. Naturally, the team of four adventurers can be made up of local or online players as well. Multiplayer makes for a much more enjoyable experience, and I daresay it’s the primary reason to pick this one up. 400 GamerScore worth of Achievements doesn't hurt either though. Fable Heroes mixes the combat of a brawler with a bit of RPG-like character building, and then throws some party game mechanics on top of it all. Everyone fights together to take down the hordes of Hobbes, Balverines, and the like; and yet a bit of competition tempers the cooperation. See, instead of collecting XP from downed enemies, you literally grab the gold that spills out of them when they die. That gold can then be spent on upgrading your character(s) in a dice-rolling minigame at the end of the level. As a result, combat is a mad scramble to grab as much gold as possible; I often stopped attacking enemies just to grab the coinage pouring out of their carcasses before other players. Thankfully you can opt to share gold equally among all players by choosing the Family difficulty – this makes things much fairer for ranged characters, who are otherwise at a disadvantage come cash-grabbing time. 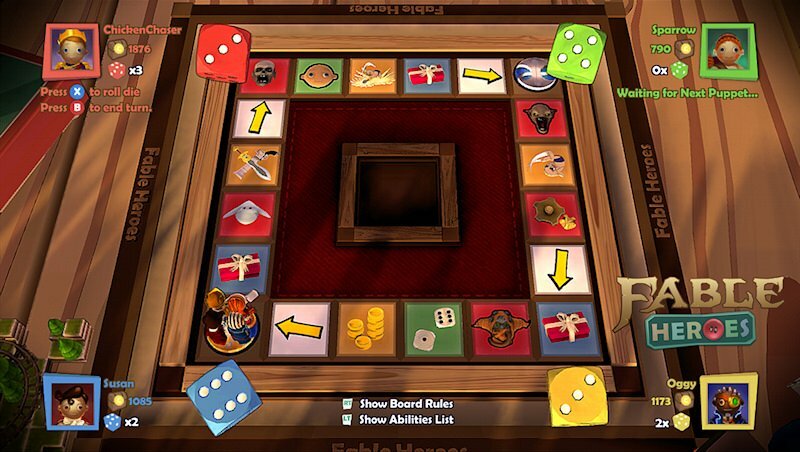 As for the dice-rolling minigame, each player gets one or more rolls per level. Most spots on the board offer three or four abilities to purchase, with a few special tiles that let you move to other spots. It’s a more random and drawn-out method of unlocking upgrades than Castle Crashers (Heroes’ closest analogue), for better or worse. When you’re down to just a few final abilities, you may have to beat several levels before you land on the necessary spaces to max out your character. As mentioned before, Fable Heroes uses an art style that’s aimed at kids. The simplistic characters won’t offend the eye, but could really have used some of the series’ trademark personality. The expansive environments pack a good amount of variety and detail, keeping each level interesting as players storm through. However, their coloring is somewhat garish and doesn’t contrast enough with the characters, leading to occasional confusion. The music fares better than the graphics, featuring several rousing themes evocative of fifties-era children’s shows. 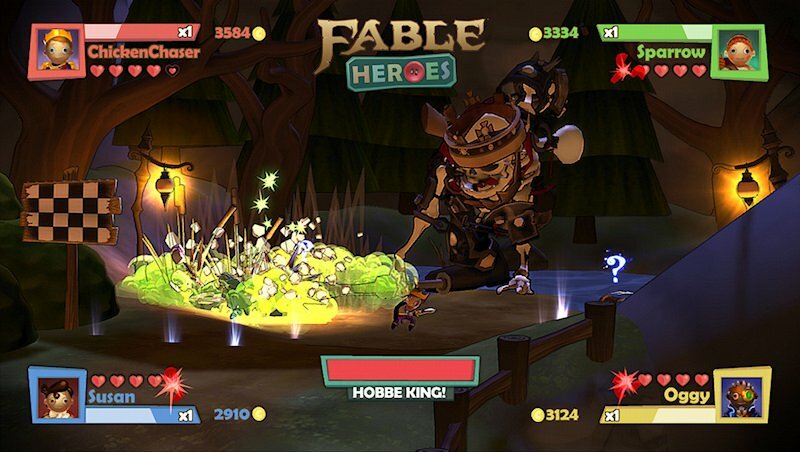 Fable Heroes has a fair amount of content to keep players busy while they hunt for gold. The game consists of approximately seven lengthy levels spread across the familiar realms of Albion, most of which feature a forking path that leads to either a minigame or a big boss monster. A fully-fledged credits level with a goofy final boss tops the journey off. After running through the game once, harder Dark versions of each level unlock as well. The special Cloud level won’t unlock until the top 100 players on the Leaderboard amass a total of one million gold, which might take a few weeks. Speaking of long-term bonuses, Fable Heroes will connect with the upcoming retail Kinect title Fable: The Journey, allowing for the transfer of gold between games and unlocking a couple of extra characters. Comparisons between Fable Heroes and Castle Crashers are inevitable. Heroes’ upgrade system isn’t as polished, nor does it have as much of the epic feel or humor as its predecessor. But Lionhead has still crafted a fine beat-em-up with a look and feel all its own. Don’t expect a true Fable game from Heroes. Do plan for a fun multiplayer experience with Fable flourishes. And if you’re looking for a new game to play with the kids or significant other, look no further. Fable Heroes costs 800 Microsoft Points ($10) and there is a free trial. Get this Xbox 360 game here on the Marketplace.